The Philadelphia Museum of Art exhibits and reassesses the collection of a great patron. 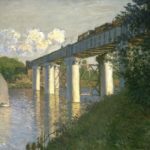 Claude Monet, Railroad Bridge, Argenteuil, 1874, oil on canvas, 21.375 x 28.875 in. 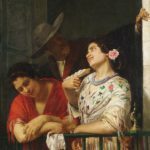 Mary Stevenson Cassatt, On the Balcony, 1873, oil on canvas, 39.75 x 32.5 in. The first use of the term “Old Masters” in reference to a European painter who was working before 1800 can be found in John Evelyn’s diary. This multi-volume work, which was published early in the 19th century under the title Memoirs Illustrative of the Life and Writings of John Evelyn, comprises the diaries of a 17th-century English writer, gardener and, you guessed it, diarist. The book, although not 100 percent verifiably true, gives a contemporary view of art, culture, and major political events of the time. Evelyn was a gentleman and traveled through Europe both for study and leisure, and as was the fashion among the gentry, he spent time with other gentleman, enjoying their hospitality and exploring their gardens, stately homes, and their collections of fine art. On one such visit was to Thomas Herbert, the 8th Earl of Pembroke, a statesman and the dedicatee of John Locke’s An Essay Concerning Human Understanding, who had inherited his title in 1683 from his brother, “The Infamous Lord of Pembroke,” so called for his notorious bouts of homicidal mania. Evelyn made the following entry: “11th. Dined at Lord Pembroke’s, Lord Privy Seal, a very worthy gentleman. He shewed me divers rare pictures of very many of the old and best masters, especially one of M. Angelo of a man gathering fruit to give to a woman and a large book of the best drawings of the old masters.” Strange to think that even before the Old Master period had come to a close, the term was already in use. This seems to evince that it the usage has to do with more than simply time. At one point the term “Old Master” was used to identify works by European painters from 1450 onward, appearing to coincide roughly with the use of oil paint by Netherlandish painters such as Jan Van Eyck, whose handling of the material would open up a new chapter in European painting made possible by the medium’s color, luminosity and versatility, and which eventually led to oil paint’s adoption as major medium throughout the continent. This original distinction, however, closed the door on the likes of Cimabue and Giotto, medieval through Early Renaissance painters whose work not only led the way for later artists but warranted its own appreciation for its considerable beauty and stylistic idiosyncrasies. Now the term Old Master commonly refers to any European work before 1800. In a sense the phrase seems to be the direct result of, more or less, too much of a good thing—so many masterly works, so little time. The implication is that a 500-year time span was so rich in visual invention, beauty, and perfection that one could believe it is united by unparalleled quality alone. However, the works, artists, and schools that fall under the umbrella of this far-reaching term do share pedagogical and cultural affinities. Painters employed apprentices in the fashion of other artisans, and painting was a skill which was equal parts natural ability and technique and style passed down from master to student. In this sense, “old master” implies a standard of quality, an ideal that could be sought and achieved through education and practice. Inspiration and vision had their place as well, but with the emergence of modern art’s abstraction and heavy conceptual concerns, the perfection of perspective, physiognomy, anatomy, and narrative which typified pre-modern works became only one path among many that an artist could follow. 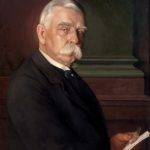 Visitors to the Philadelphia Museum of Art’s exhibition “Old Masters Now: Celebrating the Johnson Collection” will now have the opportunity to follow a wondrous path through the collection of John G. Johnson, a prominent corporate lawyer and art collector. The Johnson Collection was donated to the Museum in 1917 and comprises the core of the institution’s collection of early European paintings. Now, 100 years later, the collection is getting another look as the public is invited to view works from some of the most important moments in European painting through the lens of ever-evolving scholarship and continual conservation. The conservation, restoration, and study being done on the Johnson Collection has yielded many new discoveries about its impressive works. 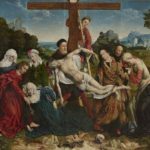 Mysteries have been solved in regard to paintings such as Rogier van der Weyden’s The Crucifixion, with Virgin and Saint John the Evangelist Mourning, which historians have recently determined to be shutters from possibly one of the largest altarpieces of the Northern Renaissance rather than an independent work, as it was previously thought to be. New discoveries about the works in the Johnson Collection include not only technical and historical discoveries but new insights into the meanings of certain works, such as Dutch artist Judith Leyster’s 1629 painting The Last Drop (The Gay Cavalier), which portrays two drunken men carousing while a skeleton (presumably Death) looks on. The skeleton, whose fleshless visage seems to smile knowingly while holding a candle and an hourglass, was only discovered after the painting was compared to another, earlier, version by Leyster. After cleaning and restoration, the skeleton reemerged in the Johnson collection’s version. 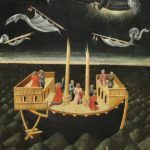 The grim humor of the painting seems to invite such a discovery, somehow allowing the informed viewer to have a similar experience to the two revelers—the realization that death has been there all along. Technically the painting is a stunning exercise in rendering light realistically. The sands run and the wax melts as the two men cavort. The candle the skeleton holds illuminates the drunken men’s bodies and faces from slightly below, giving them a ghastly appearance, the rest of the small room falling into darkness. The overall effect is both blackly comedic and moralizing. The Last Drop is only one of many Dutch masterworks in the Johnson Collection. The Dutch Golden Age represents one of the European tradition’s greatest reckonings with naturalism and genre painting, which included innovations in still life and landscape, and renderings of light. It produced one of the greatest Old Masters of all, Rembrandt van Rijn. Rembrandt’s oil on oak panel painting Head of Christ, which is dated between 1648 and 1656, is a gently realistic depiction. The play of light on the face of Christ is highly detailed, illuminating individual hairs on the savior’s head and in his wiry beard. The background seems to fall away into a shade of brown just distinct enough to differentiate it from the figure’s clothing, a nondescript robe which symbolizes Christ’s poverty and humility. The Johnson collection boasts enough Dutch paintings to rank among one of the world’s largest caches of Flemish masterworks, including a number of paintings by genre painter Jan Steen and Jacob van Ruisdael, widely considered the preeminent landscape painter of the Dutch Golden Age. Johnson was also one of the first Americans to collect the work of Hieronymus Bosch, whose oil on panel Adoration of the Magi is included in the exhibition. Bosch’s depiction of the theme is filled with the type of detail and figures one has come to expect from his work—the donkey and the cow in the stable behind the main action seem to invite as much consideration as the Christ child himself. Another Dutch masterwork depicting a common theme from the Catholic lexicon is Jan Van Eyck’s oil on vellum on canvas painting St. Francis of Assisi Receiving the Stigmata, dated 1430 and 1432. The painting represents a sumptuous use of oil, achieving with the versatile medium an extraordinary range of shades and level of detail. The square format of the work has a focusing effect, and Van Eyck’s composition works with the shape, mostly filling it with his figures but leaving enough space for a background filled with dazzling renderings of rock with highly realistic depth and color. The exhibition also includes some of the most recognizable names among Italian Old Masters, including Titian, Botticelli, and Fra Angelico, whose St. Francis of Assisi provides visitors with an Italian vision of the animal-friendly icon to compare with Van Eyck’s depiction. The works of the Italian Old Masters have also benefited from contemporary conservation and scholarship. Titian’s 1558 oil on canvas Portrait of Archbishop Filippo Archinto is one such work, its colors, faded over time, having been discovered and interpreted in terms of their original significance in the artist’s time. The painting depicts the Archbishop sitting behind a semi-transparent curtain. The image is unusual and highly symbolic; the curtain represents the Archbishop’s political troubles, which prevented him from accepting the archbishopric of Milan. The figure seems almost like a gleefully self-imposed obstacle course for Titian. Half of it is rendered with the detail and clarity one would expect from a direct view, and the other half, obscured by the curtain, is blurred. The optical reality of seeing is masterfully handled, and the play between the surface of the curtain and the figure visible behind it causes the eyes to run back and forth along with the viewer’s mind. In this portrait Titian seems to prefigure both the Impressionists and Gerhard Richter’s optical explorations of soft focus over 400 years later. The Johnson Collection also includes works made during John G. Johnson’s life including paintings by Manet, Monet, and Courbet, some of the most significant emerging—for lack of a better term—new masters. Courbet’s 1866 oil on canvas on gypsum board painting Marine is a moody seascape in which menacing dark clouds fill the canvas. The clouds are economically rendered with long unbroken brushstrokes that herald the painterliness that would come to further prominence in later modern works and achieve ultimate freedom in pure abstraction. 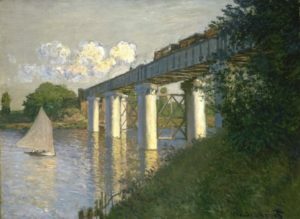 Claude Monet’s 1874 oil on canvas Railroad Bridge also includes a waterscape, as well as a bridge over which a train is passing. Smoke billows from the train, filling the the flat gray sky with man-made clouds. Johnson’s apparent taste for the nautical and the gray are present in both the Courbet and Monet paintings. Something else is present as well—originality. The contemporary works Johnson collected display innovation which both extends from and breaks with the works of the Old Masters. Seeing both together allows these similarities and differences to shine through and gives visitors to the exhibition a more complete story of European painting’s evolution from the old to the new. The more Johnson’s collecting is considered, the more his spiritual fraternity with the likes of John Evelyn and other art-appreciating gentleman of the past becomes clear. He traveled, practiced law, and collected beautiful works of art, and the exhibition includes a gallery dedicated to the man himself, documenting his life and career. It serves as a nice addition to an impressive collection of masterworks. In the end, however, seeing the art Johnson collected during his life allows the viewer another way of seeing the man through the precious gift he left.